The island of Kos is often compared to a dolphin for the resemblance of its shape: the peninsula Kefalos be the tail of the dolphin. Southern peninsula Kefalos(Κέφαλος χερσόνησος) presents the wildest landscapes and most rugged of the island of Kos , but it also has one of the most beautiful beaches, the beach of Agios Theologos , located at the end of a winding road dotted with small churches. road southwest leads to the monastery of St. John the Evangelist and the beach of Agios Theologos is the extreme western tip of the island of Kos , located 47 km west of the capital of the island Kos . The south of the peninsula is dominated by Mount Latra (426 m) (Oros Latra,Όρος Λάτρα). The southernmost tip of the peninsula, Cape Krikello is not accessible by car. Leaving Kefalos and taking direction from south to Kamari , there is the Byzantine chapel of Panagia Palatiani, located 3 km from Kefalos shortly after Kamari (direction sign "Panatia"). 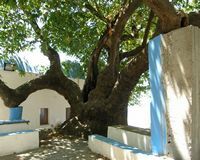 This chapel was built in 1988 on the site of the ancient capital of the island of Kos , Astipalea or Astypalea, or Astypalaia (Greek Αστυπάλαια). 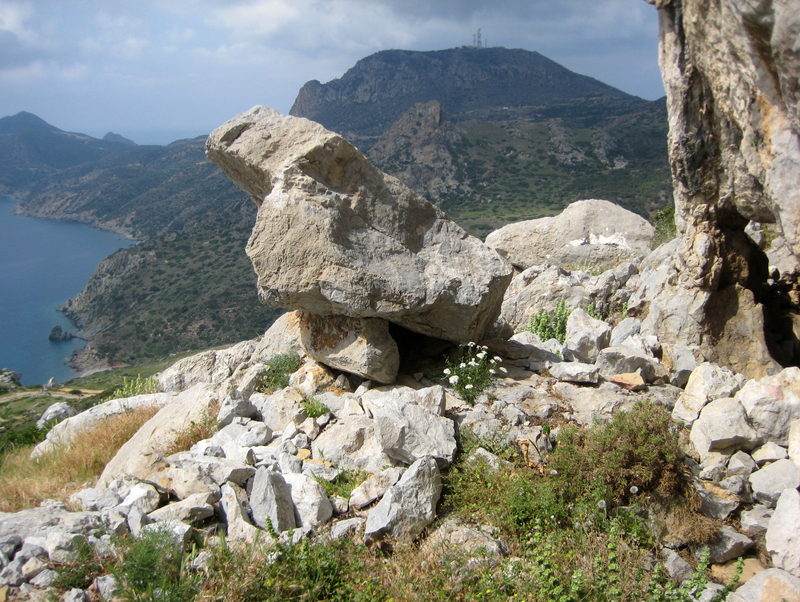 Astypalaia was destroyed by an earthquake in the fourth century BC, but some vestiges of the old city remain, including an acropolis with a theater and two temples, one dedicated to the god Asclepius, the other the fifth century BC, to Demeter, the goddess of agriculture (the goddess Ceres of the Romans). 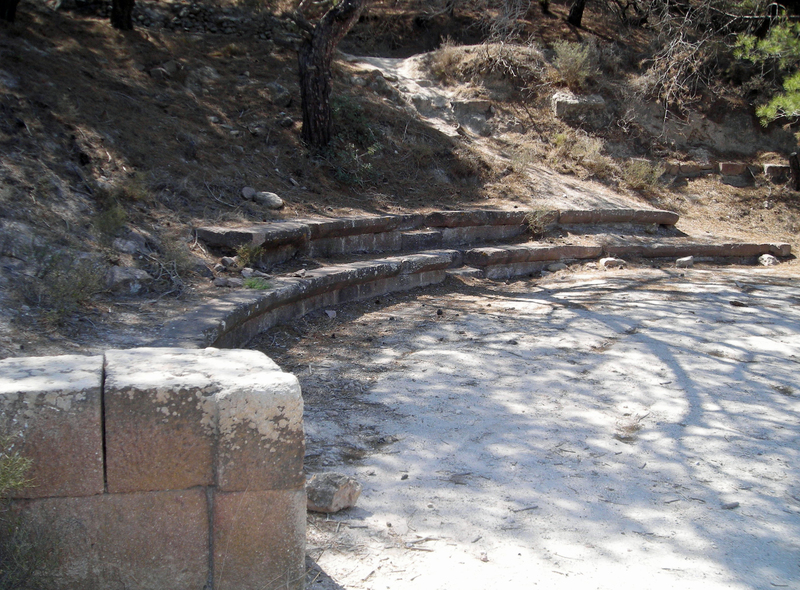 Hellenistic theater there are only two rows of seats, 500 m away by a cross-road, after crossing an unmarked door, but not locked, we find the ruins of a Doric temple dedicated to Asclepius, the god of healing. Admission is free. A little farther than the Panagia Panagia Palatiani is Ziniotissa, Our Lady of Mount Zini. In the cave of Aspri Petra (Roche Blanche) an ancient settlement was unearthed in 1922 by archaeologists from the Italian Archaeological School of Athens. The settlement dates from the late Neolithic to early Bronze Age (2900 - 2100 BC) were discovered fragments of pottery, grinding stones, a terracotta pot engraved blades and volcanic glass, decorative items and food scraps. 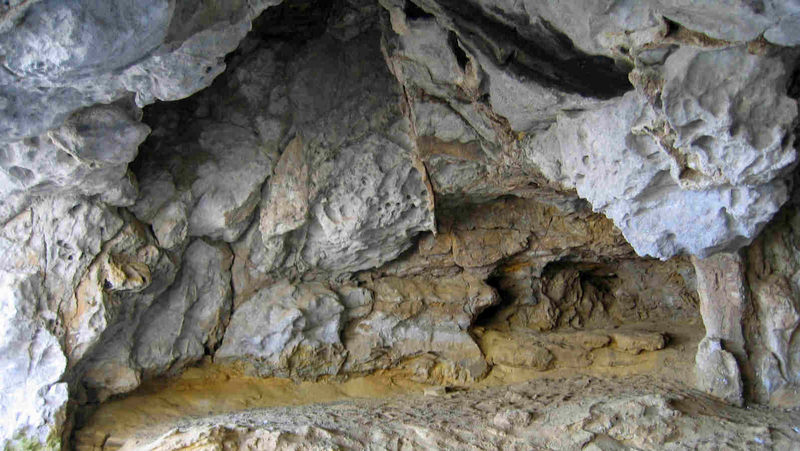 The cave of Aspri Petra, located on the southern flank of the volcano Zini is accessible on foot in half an hour, a path that begins on the left, shortly after the site Astypalaia . 7 km from Kefalos, continuing on the small road that goes to south through spectacular scenery, we find, after Aspri Petra , the Monastery of St. John Thymianos (Agios Ioannis Thymianos,Άγιος Ιωάννης θυμιανός), also known as St. John the Baptist (Agios Ioannis Pródromos,Άγιος Ιωάννης ο Πρόδρομος). The paved road ends here. The building is topped by a huge plane which even exceeds the height of its steeple. This charming monastery is usually locked. Coming from Kefalos, and branching right after Kamari south-west, we take a small road, 5 km, which leads to the isolated monastery St. John the Evangelist and St. John the Theologian (Agios Ioannis Theologos, Άγιος Ιωάννης Θεολόγος). 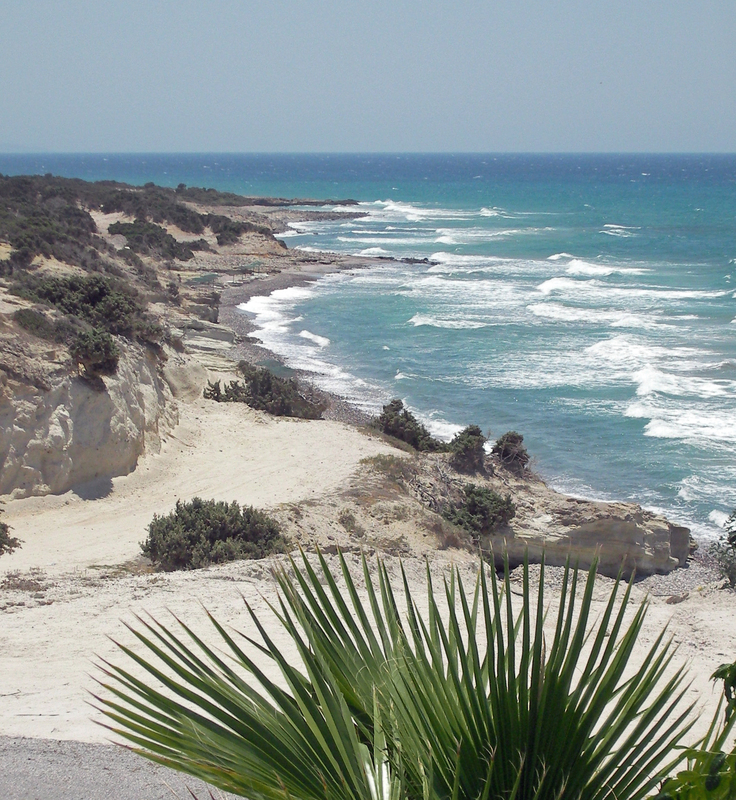 The extreme west of the island of Kos offers to those who seek peace and tranquility, beautiful beaches nestled in rocky coves. The beach of Agios Theologos is at the end of the road to the monastery of St. John the Evangelist, 7 km southwest of the city of Kefalos and one hour drive from the city of Kos . The site is conducive to diving in waters teeming with life, but especially surfing and windsurfing because the beach is very windy, the waves, blown by westerly winds are very popular with surfers. We also like to end the day in this beautiful watching the sunset from the terrace of one of the tavernas serving delicious fresh fish. 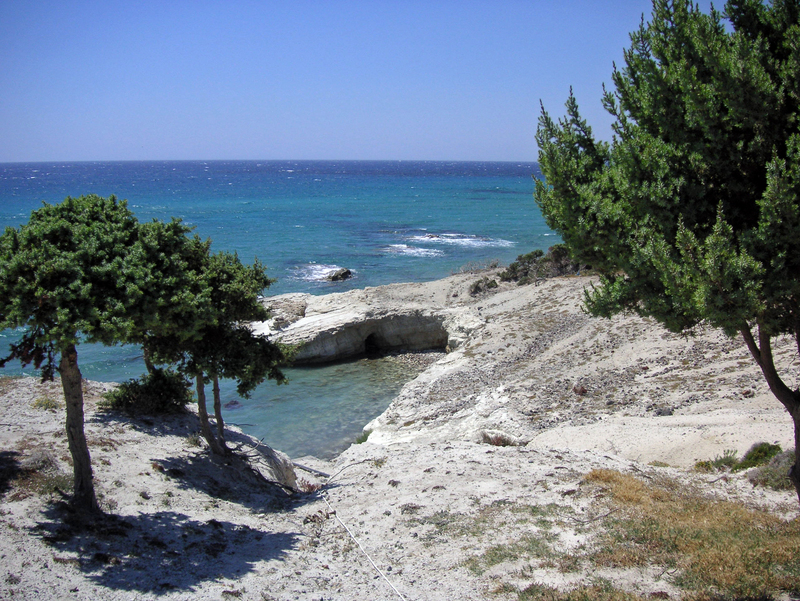 A little further south, a dirt road, not shown, conducts, after a little less than 4 km to the naturist beach Hilandriou, a range of 300 m, but not fitted on the bay of the same name. Tavern Agios Theologos is just above the beach of Agios Theologos, in a sumptuous setting where you can enjoy the famous sunsets. This pleasant restaurant, founded by the family Vavithis, tasty cuisine made from the products of the land owner, including his house goat cheese (feta), olives and bread. The rest of the card is rich locally sourced fish, seafood, vegetables and honey. Tavern Agios Theologos is a seasonal restaurant open only from May to October. Dishes of the day from 10 to 15 €.